Bob Watts lives at the Six Nations of the Grand River and is of Mohawk and Ojibwa descent. He is an adjunct professor and fellow at Queen’s University’s School of Policy Studies, and vice-president of Indigenous relations at the Nuclear Waste Management Organization. To appreciate Anishinabek leadership, it must be understood within the context of its creation and how it has evolved. It is both difficult and perhaps inappropriate to try to represent a worldview in a few short paragraphs, and I apologize in advance if anyone is offended by this attempt. The following paraphrases an interview with Elder Fred Kelly, some of his writings, the notes of Wilson Ashkewe, and other lessons I’ve learned over time. In the beginning, the Great Spirit placed the four colours of humankind in the four directions. Each colour was given the special gifts of life, law, freedom and will. These four original gifts thus formed the basis for a life of peace and harmony with all creation. The Anishinaabe were placed to the west on Turtle Island. This is the vantage point of the universe for the Anishinaabe. And living by the Laws of the Creator, they grew into a thriving people. Because everything is made by the Great Spirit, all life is imbued with the sacred. From the smallest insect to the biggest animal, from the tiniest grain of sand to the largest galaxy, all is alive and everything is intimately and spiritually connected. There is no such concept as animate or inanimate. At a time when the Earth was totally covered with ice, the Anishinaabe were in a most pitiful state. Waabi Muhkwah, the White Bear, came down from the North and saw the sorrowful conditions of the people. He took pity on the people, and put forth to adopt, care and protect them as brothers and sisters, thereby creating the first n’dotem (clan). Then, Waabi Ma’ingan, the White Wolf, came over from the East and also adopted the Anishinaabe as brothers and sisters to become the second clan. In a similar manner, Waabi Pinesse, the White Winged Spirit, came up from the South in kindness and adopted the Anishinaabe. Finally, Posh’kote Pishikii, the White Buffalo, came over from the West and adopted the Anishinaabe and became the fourth original n’dotem. In time, all other spiritual beings followed until all Anishinaabe families were adopted, forming Ototaimimaug (the original clans). their unity, while at the same time maintaining the dignity, integrity and personal identity of the individual. Through changing times, the clan system remained strong and was a key to the strength of the people, their collective identity and their unity. In one teaching, my friend Mark Phillips speaks of three consultation circles in the community. These circles were in addition to clan responsibilities and provided a forum to speak to specific matters. Those circles were the Women’s and Children’s Circles, the Elders’ Circle and the Men’s Circle. Each of the consultation circles had specific duties and considerations to bear in mind. The Women’s and Children’s Circles had a duty to consider matters in light of the future. In addition, the Women’s Circle had to agree before any war was considered, as it was their sons, brothers and husbands who might be lost. The Elders who were — and are — the repository of our history, consider matters in light of past events. The Men’s Circle was to consider the issues in light of current events and needs. Elder Dominique Rankin, Algonquin, in Ottawa on May 31, 2015. In addition to the time frames that guided the consultation circles, other considerations such as political, social, economic and health needs guided consultations. Those consultations were conducted in a prayerful and respectful manner with the knowledge that true consultation was the key to understanding. Being a Chief was seen as temporary, and there were few lifetime Chiefs because they were the poorest in the community. They were poor because their duties included taking care of the sick, old and orphans, and thinking of others before themselves. Chiefs were taught that they should be advisors to the people and that spiritual consensus is the highest form of politics. 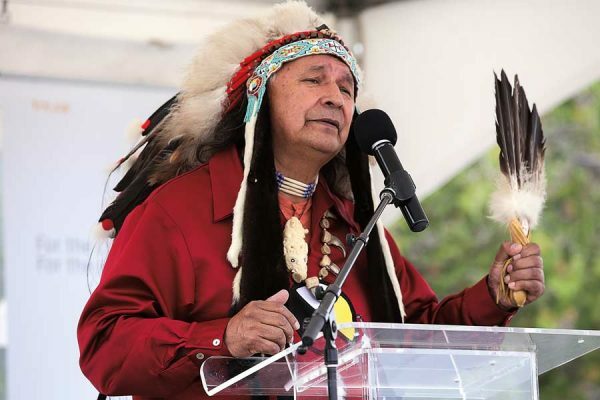 Most Indigenous leaders today are confronted with a multitude of issues they must manage cooperatively if they are to make the transition to an adaptive leader, or a leader acting in a manner consistent with traditional teachings. The system today’s leaders are working within (usually one imposed by the federal government) is not the system or society that the traditional leadership role was originally developed for. The impacts of the Indian Act (first passed in 1876) and the actions of the federal government have ingrained in many of our people the notion that someone else will make decisions for us. The devastating effects of residential schools wherein individual initiative and expression of our culture was punishable in a brutal manner compounds this. This brutal enforcement of conformity to a non-Indigenous worldview, combined with an enforcement regime that pitted individuals against one another, has created a shameful legacy. Perhaps now more than ever, traditional Indigenous leadership and governance is necessary. It is critical that people feel part of the decision-making process and that their voice is important. Hope is crucial to our survival — and what better way to help give people hope than to make it clear that there is a role for everyone in the community. The need to help create change must be done in light of the culture and values of the community. 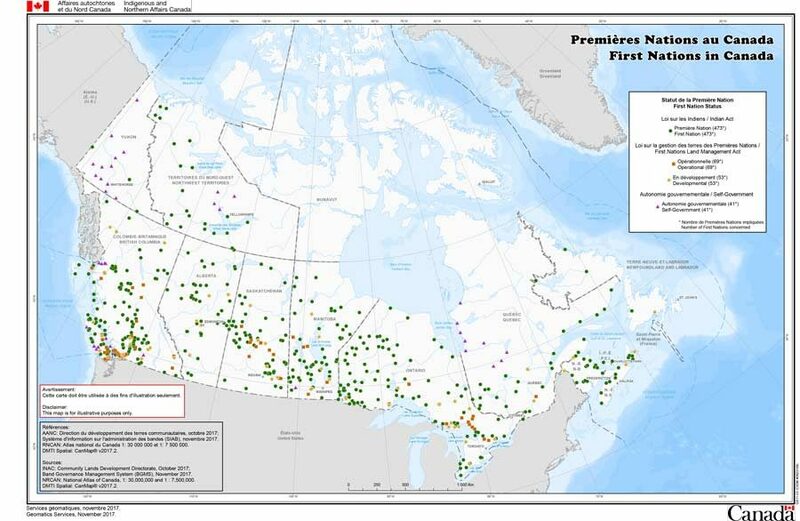 Government of Canada map of First Nations in Canada.